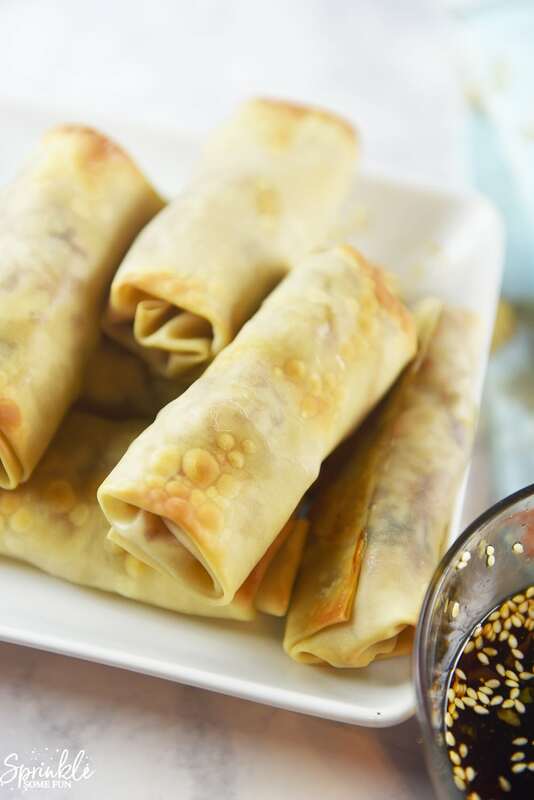 Baked Turkey Egg Rolls are a delicious dinnertime side dish or a great option for any party! Baking them in the oven results in a crispy crunch without having to deep fry them. These would also make a great air fryer option as well. 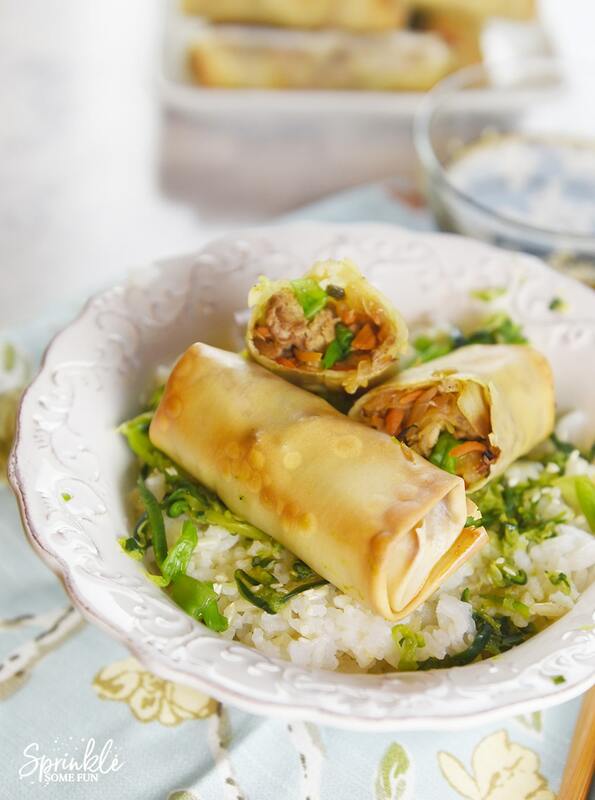 These Baked Turkey Egg Rolls are part of a sponsored post with Honest Turkey by Honeysuckle White. All opinions are my own. One unintended consequence (actually benefit) of having children is that we eat out a lot less often than when it was just the two of us. I do miss the occasional treat of not having to make our dinner, but I can’t say I really miss eating out all the time. 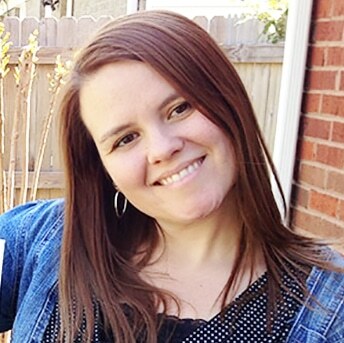 It took a little getting used to, but it makes me feel great that we can eat our favorite meals healthier at home. One thing that we love to eat as a family is Asian inspired meals and I am always glad to experiment with new Asian inspired recipes. 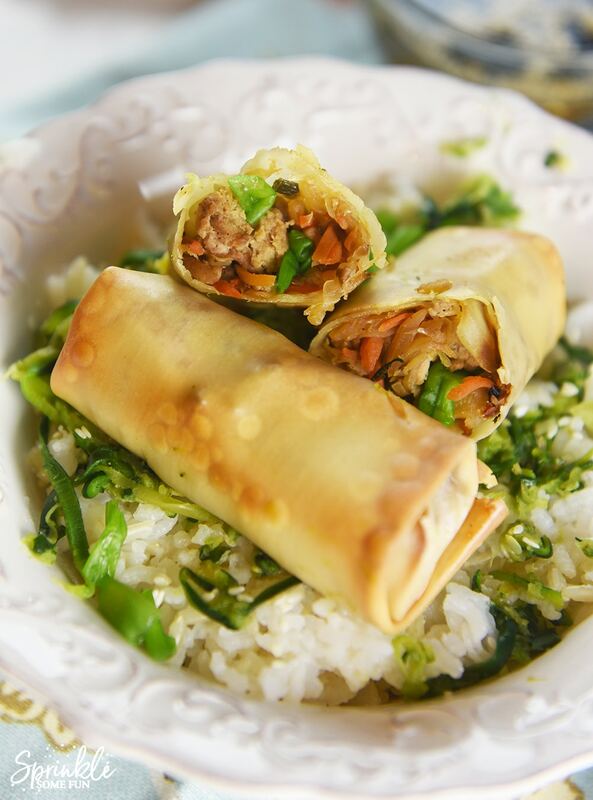 These Baked Turkey Egg Rolls are so yummy that we never miss the take out version! My kids even say they prefer the baked version. That’s a real win for me! These are also great for gatherings or large families because it’s easy to make a large batch of them and serve them later. 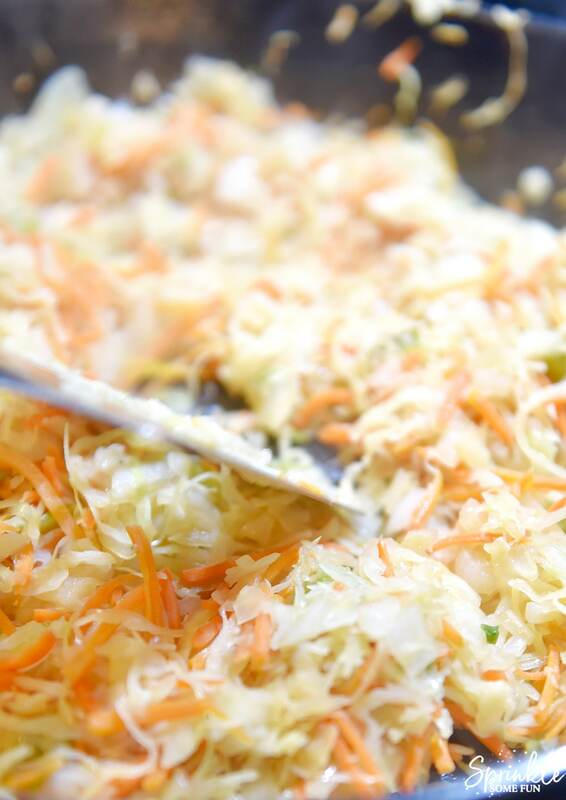 These are also great to freeze and heat them up again for an amazing side dish. I like to pack my egg rolls with lots of veggies and lean meat. 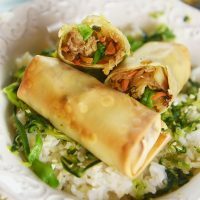 Ground turkey is the perfect meat for these egg rolls and I was excited to see that our stores carried the Honest Turkey ground turkey by Honeysuckle White in our Tulsa Walmart stores. Honest Turkey by Honeysuckle White is turkey raised with care by independent family farmers with no antibiotics and no added hormones or steroids. This is exactly what I look for with any meat product and it’s great that I can now find it easily at Walmart. To make the egg rolls I sauté the veggies in one large pan and brown 1 pound of the Honest Turkey by Honeysuckle White in another pan. Then I let everything cool down and that’s when the kids get to help! Now comes the rolling. If you have a couple of people rolling it goes by fast. This is such a great family recipe that you can get the whole family involved in (if you wish). We like to serve our egg rolls with just a little bit of teriyaki sauce on the side and a bowl of rice with veggies. These are SO good! My kids had no problems gobbling them up. 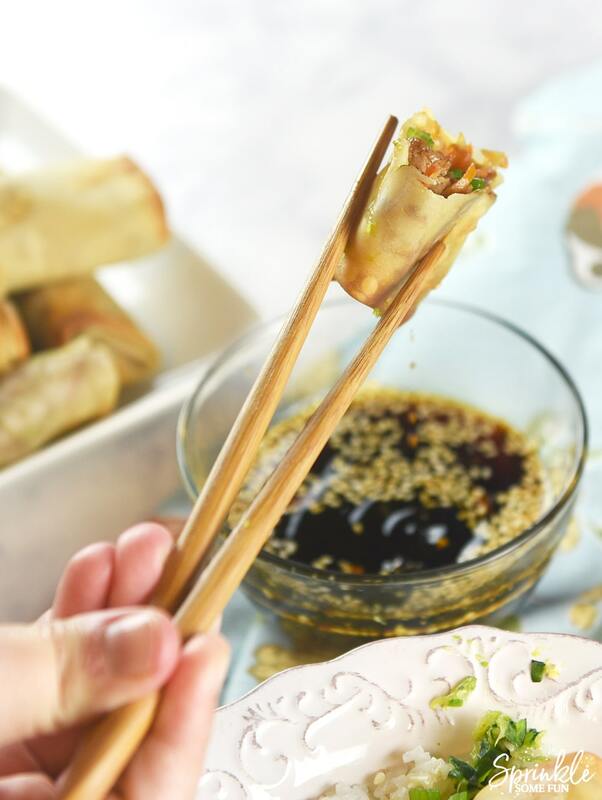 Have you ever tried Baked Turkey Egg Rolls? I think you will love the fresh taste of these! 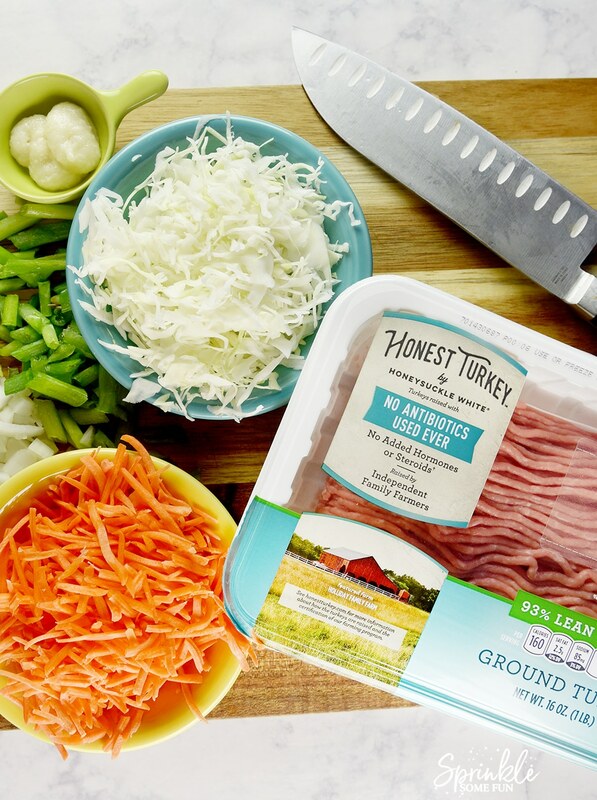 Be sure to check out Honest Turkey by Honeysuckle White which is available in 93 percent lean ground turkey and 99 percent lean ground turkey breast at Wal-Mart in select markets. First prepare a large pan with 1 tsp. olive oil on medium high heat. Add the white onions first and sauté them until transparent. Then add the rest of the veggies, garlic, soy sauce, ginger, and green onion. Cook on medium high heat until veggies are tender. Meanwhile brown the turkey in a medium pan on medium high heat until well cooked. Add the meat to the veggies when done and stir together. This is the mixture that goes into the egg roll wrappers. Preheat oven to 400 degrees F. Add a couple of Tbsp. of the mixture on the egg roll wrapper and then roll it up like a burrito. You can add a little egg wash to the tip to help it stick together. Spray the pan and the tops of the egg rolls with a non stick spray or a mist of oil. Then bake at 400 degrees F for around 15 minutes or until the egg roll wrappers have reached a golden brown. Serve immediately or store in the fridge for up to two days (and then reheat to serve). You can also make these ahead and store in the freezer for a couple of months and reheat to serve.